Aarushi murder case is one of the most mysterious cases in the crime history of India. Arushi Talwar and her servant Hemraj were killed on 16th May 2008 at Jalvayu Vihar in Noida. UP police investigated this case and found that victim’s father Dr. Ramesh Talwar has murdered his own daughter and his servant. After sometime, case has been transferred to CBI and CBI given clean chit to Dr. Ramesh Talwar and arrested some servants. But after more time CBI found that servants are innocent. CBI can not found any strong evidence against killer but they submit the closure report in court with comment that Dr. Ramesh Talwar is main suspect in this case but there is no any proof full evidence against Dr. Talwar. Lie detector and narco tests conducted on both parents have proved to be inconclusive and on December 29, 2010, the CBI filed a closure report in the twin murders, clearing the servants but pointing a finger of suspicion at the parents. To make matters worse, on January 25, Rajesh Talwar was attacked by a deranged man with a cleaver in the Ghaziabad court premises. Court on 09.02.2011 ordered that case should be registered against Dr. Ramesh Talwar and Dr. Nupur Talwar as prime suspect in this murder case. Now CBI have to solved most puzzled case again. There are many clues that says that Dr. Talwar pair were not unknown in this murder mystery and they are trying to hide some things. (1) Why they locked Aarushi’s door daily? (2) How is it possible that if a murderer came from outside and went after murder then main door is locked from inside? May 16, 2008: Aarushi Talwar found murdered in her bedroom. Domestic help Hemraj, who was missing, suspected as the killer. May 17: Hemraj’s body found on the terrace of Talwars’ residential building. May 18: Police suspect “insider job” as the murders were done “with surgical precision”. May 19: Talwar’s former domestic help Vishnu Sharma named suspect. May 21: Delhi Police joins murder probe. May 22: Family comes under suspicion, as police probe honour killing angle. The police quiz Aarushi’s close friend. 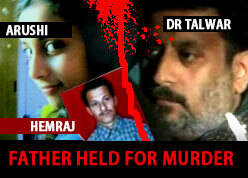 May 23: Aarushi’s father Rajesh Talwar arrested as a key accused. June 1: CBI takes over the probe in the case. June 13: Talwar’s domestic help Krishna arrested by CBI. June 20: Lie detection test of Rajesh Talwar conducted at Central Forensic Science Laboratory, Delhi. June 25: Second lie detection test conducted on Nupur Talwar. Her first lie detection test was found inconclusive. June 26: CBI declares it a “blind case”. Rajesh Talwar denied bail by a special Ghaziabad magistrate. July 3: Supreme Court rejects a PIL challenging the administration of narco-analysis test on the accused in the case. July 12: Rajesh Talwar freed on bail from Ghaziabad jail. January 5, 2010: CBI moves court to conduct narco test on Talwar couple. December 29: CBI submits closure report. Gives clean chit to servants, but points fingers at parents. January 25, 2011: Utsav Sharma, the alleged attacker of Ruchika Girhotra molester — former Haryana DGP S.P.S. Rathore — attacks Rajesh Talwar with a cleaver on Ghaziabad court premises. February 9: Court takes cognisance of CBI report and asks it to continue with prosecution charging Aarushi’s parents with murder and destruction of evidence. March 8: The mother of Dr. Talwar's attorney is found murdered in her home. March 18: Supreme Court stays High Court order against the Talwars. March 21: The Talwars surrender passports to the Ghaziabad District Court. March 25: Hemraj's widow files application in Ghaziabad Court claiming Talwars killed him and Aarushi. April 08: SC pulls up Talwars for not submitting their original plea. April 11: Talwars due in court April 15,2011. April 15: Supreme Court seeks CBI's response in Aarushi Talwar case. April 22: CBI charges Rajesh Talwar with forgery and concealing facts. April 23: CBI says "Only parents could have killed Aarushi". April 27: Aarushi's hearing in CBI court on July 20.